HEMPEL'S SILICONE ALUMINIUM 56914 is a heat resistant aluminium pigmented polysiloxane paint which cures to a hard film at ambient conditions. 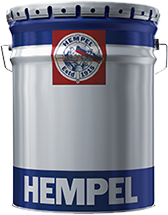 HEMPEL’S SILICONE ACRYLIC 56940 is a heat resistant acrylic modified polysiloxane paint. It is air drying at ambient temperature.